Eco-to-Go is back at Rendezvous for Fall 2013! 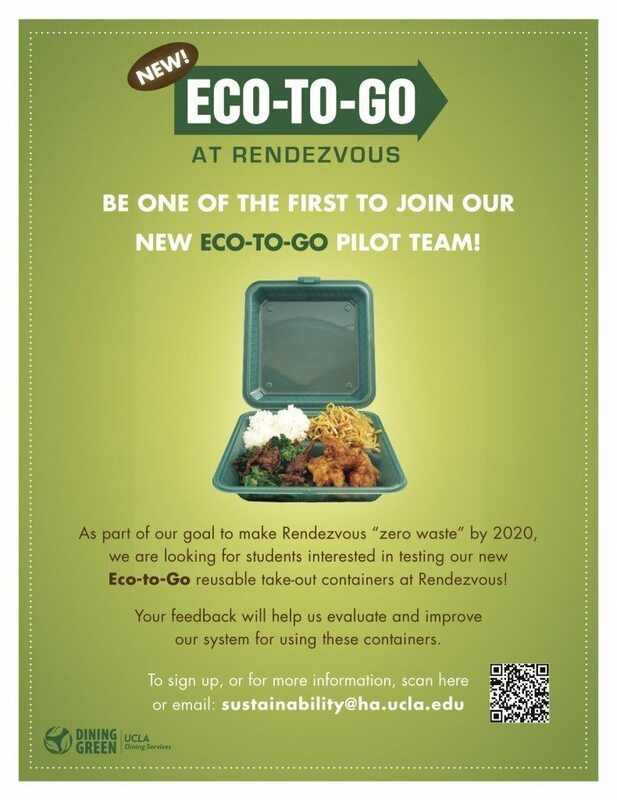 Thank you for showing interest in our Eco-to-Go Pilot Program at Rendezvous. This pilot program is intended to evaluate a new container option and how effective a full-scale program might be using reusable take-out containers. Over 2,000 disposable containers are used on a daily basis in Rendezvous—many of which do not end up in the compost bins. Providing the option for guests to use a reusable container reduces how much waste is thrown away. In addition, the reusable container has lower environmental impacts throughout its entire lifecycle (raw material extraction, production, distribution, and disposal) compared to a compostable container. These containers are also sturdier than disposable containers, which means it is easier for you to take your meal on the go. The containers are made with polypropylene—100% non-toxic, BPA free plastic. This material is dishwasher safe, microwaveable, and can be used to contain both hot and cold foods safely. Each time you visit Rendezvous the key tag or container can be exchanged for a clean container. The key tag “reserves” your place in the system should you decide to return the container. You will never be in possession of a key tag and container at the same time. To sign up, visit the check stand at either side of the restaurant. Mention you want to sign up for the Eco-to-Go container program. We ask that you provide us with your name and email address to be a participant. In return, you’ll receive a key tag (key chain) that identifies that you’ve signed up. Option 1: Keep the container with you until the next time you come to Rendezvous. The next time you order your meal, show the check stand your empty, used container. When done ordering, take your dirty container to the container return. You’ll receive your food in a clean container. Option 2: Return the container immediately to the container return and ask for a key tag from the check stand. Turn in the key tag the next time you order. Due to operational limitations, the following cannot be served in an Eco-to-Go container: nachos, Asian specials, or soups. Note: When ordering a combo meal on the Asian side, be sure to let the serving staff behind the counter know you’d like it in an Eco-to-Go box (green box). Check out the flyer for the Eco-to-Go Pilot program from Spring 2013!